Google Chrome is a web browser developed by Google and based on the WebKit layout engine and application framework. On January 08, 2009 Google introduced a new release channels system, and now there are three distinct release channels – Stable channel, Beta channel, and Developer preview channel. New version of WebKit. WebKit is the open source code Google Chrome uses to render web pages (HTML and CSS). 1.0.154.36 used basically the same version of WebKit as Safari 3.1, but the WebKit team has made a lot of improvements since that was released. 156.1 uses WebKit version 528.8 or, more precisely, revision 39410 from the WebKit source tree. In addition to fixing bugs and enabling features like full-page zoom and autoscroll, the new version also enables some nifty CSS features. Look like the Mac and Linux versions of Chrome are getting closer. Are you going to switch to Google Chrome under Linux? 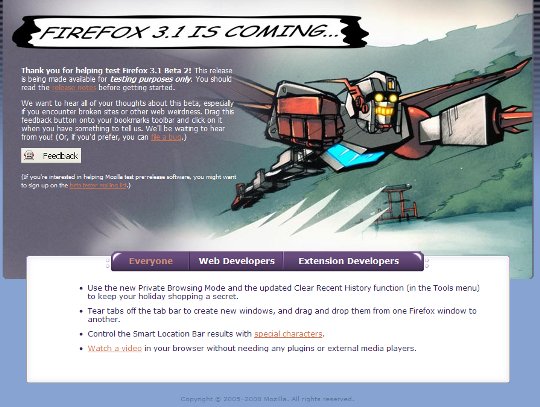 Firefox 3.1 beta 2 has been released and available for download. Firefox 3.1 Beta 2 is available in over 50 languages as a public preview release intended for developer testing and community feedback.